I'm doing a lab and I'm trying to understand exactly why I'm using the tool "minus". I have a raster which I'm calling "heights". I also have two rasters with water surfaces and watercourse. 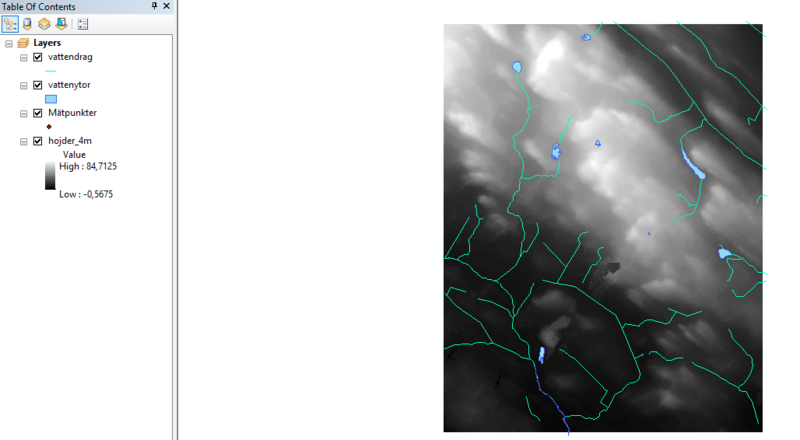 I have changed the values in the water rasters so that water pixels has the value 10 and noData has the value 0. 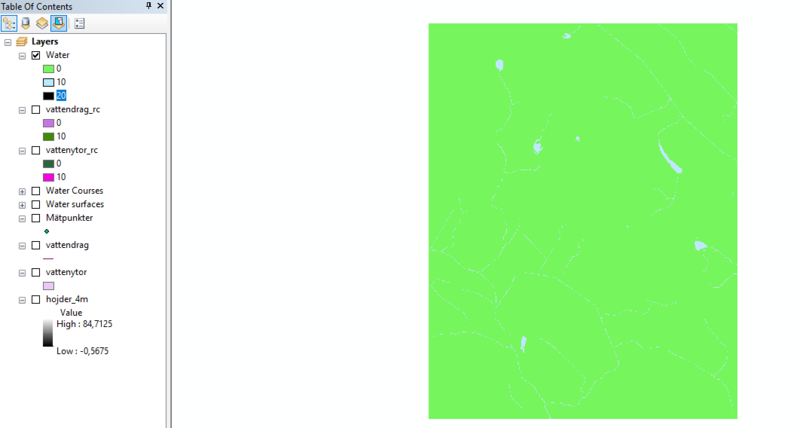 I have then used the tool "plus" to put these two rasters together into a joint raster which I'm calling "water" plain and simple. Now, I am supposed to use the tool "Minus" to put in the water raster together with the raster heights, I can't understand why I need to do that. My first thought was that the intention is to make sure that it's only the watersurfaces that shows up in my result later on and not land surfaces, but that doesn't seem right. Why am I using minus in this scenario? It's to lower the watercourses I guess but why is that needed? The final goal of the lab is to find out from what area of the map a poison is coming from. To investigate this I have made an analysis of the watersurfaces in the area based on the water surfaces data and the flow direction. "after I have run the layer heights minus the layer water the watercourses will be lower than they really are in comparison to the surrounding surface. This happens because the pixels in the raster water i have the water values at 10 everything else at 0 (with reclassify). The height data will then get a value that's -10 lower than all the water courses. I'm doing this to get elevation in all the watercourses and in the modell the water will prefer to travel trough the water courses that's within the flow direction area. If I don't do this then some water courses may be without elevation and /or streams will be in the wrong places, even if I have a perfect height model, compared to where the actual streams are. So, I'm using this method to increase the chance that the watercourses are where they should be"
This was dead wrong. The answer I received that it will very well work with a perfect height model and that the height model should do just fine for analyzing. So the answer was wrong, that's not why I was using minus. I'm totally lost here. No idea why of would use minus if that's not the answer. Any ideas? I changed the values with reclassify so that all the water pixels have value 10 and noData has the value 0. I combine these two layers with "plus" and create a layer I call "water"
Then I use the tool "minus" that I'm having problems motivating why I'm using. I combine the water raster with the height model raster. Next steps is to Use "fill" on the height layer, flow direction and watershed to control where the poison in the water is coming from. I can also use flow accumulation and snap pour point . Browse other questions tagged raster arcmap spatial-analyst watershed map-algebra or ask your own question. River channel is cut after rendering flow accumulation in hec-hms? Determining inflow outflow of polygon based on flow accumulation? Using tool “minus” in height model?